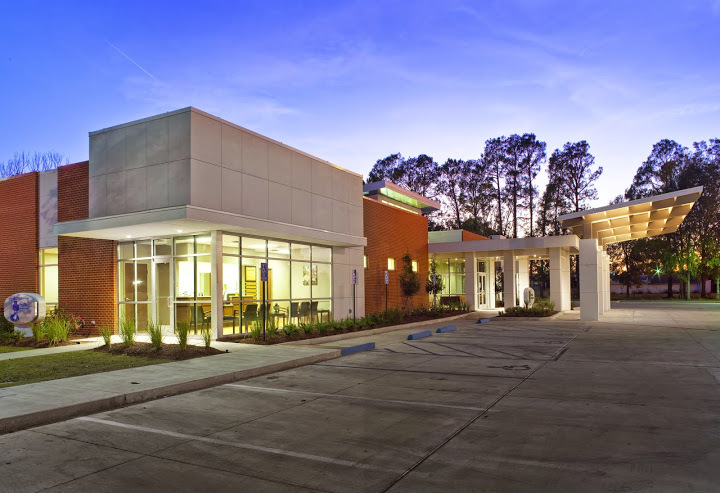 A single story Medical Office Building with an exterior facade of brick veneer, aluminum/glass curtain wall and stucco that is accented by a large prominent covered drop-off with handicapped accessible covered parking to the side. From the main entrance an open Lobby runs the full length of the facility. It contains a towered clerestory on one side and raised ceilings to defining individual departments. Each individual department within the Primary Care side of the facility access the Lobby and each contains a systematic and purposeful workflow. In addition to the Primary Care there are three separate tenant spaces that have their own separate entrance and lobby and parking. The functional layout provides tenant spaces for a 13,645 sq.ft. Primary Care Facility, a 2,821 sq.ft. Wellness Center, a 2,699 sq.ft. Pain Management Center and 3,067 sq.ft. ENT Clinic. The building is Phase 1 of a overall 45,000 sq.ft. facility and this is reflected in the design of the plan, structure and site which allow for the connection of the Phase 2 building.